Additionally, the ACA established a formal framework for considering the transition from ‘volume to value-based’ healthcare through the creation of the Innovation Center.6 Among the seven broad approaches for achieving this migration, two methodologies were of particular relevance to NeuroInterventionalists; the Bundled Payment for Care Improvement Initiative and Accountable Care Organizations, with both approaches remaining active elements into the present day.7–11 Prior to passage of the ACA, the problem of Americans lacking adequate health insurance coverage (absent or insufficient) grew worse each year. In 2010, 55.3% of Americans were covered by employer-based insurance.12 The elderly and poor, as well as some additional vulnerable groups, were already covered by Medicare and Medicaid (14.5% and 15.9% 13 of the population respectively).13 Additional programs, such as the Veterans Health Administration, provided coverage to a small proportion of the population. Shockingly, by 2010, almost 50 million Americans had no form of medical insurance. The drafters of the ACA legislation considered expanding coverage to be mission-critical. Ultimately, they decided on two main strategies to achieve that goal. The first strategy was Medicaid expansion. By increasing the number of patients eligible to receive Medicaid, many more people would obtain insurance coverage. To enable this expansion, the ACA loosened the criteria required for becoming a Medicaid beneficiary and millions of additional patients signed up for the program. Nonetheless, a large cohort of patients remained uninsured because they lacked employer-based coverage and remained ineligible for either Medicare or expanded Medicaid. How would these patients obtain coverage? The second strategy sought to address this challenge. The ACA provided for the creation of a marketplace for health insurance for those individuals, that is, the healthcare exchanges. Medicaid is a ‘safety net’ program.14 The ACA expanded Medicaid by requiring that states which participate in the program extend coverage to patients with incomes at or below 133% of the poverty line. New categories of eligible individuals were also created, most significantly, childless adults. The federal government would initiate the program by paying for 100% of the expansion costs, gradually dropping that payment to 90% of eligible costs. The National Federation of Independent Business (NFIB) sued the federal government, and in 2014 the Supreme Court in NFIB v. Sebelius decided that states did not have to participate in Medicaid expansion to continue to receive their pre-existing level of federal support for their state’s Medicaid program. Seventeen states chose not to participate in Medicaid expansion. These states were generally led by Republican governors and legislators, underscoring the deep political divide concerning the ACA. Concerns raised included the philosophical (eg, the expansion went beyond the initial scope of Medicaid as a safety net program) as well as the practical (eg, the ultimate cost for the states of the uncovered portion of Medicaid expansion). Healthcare exchanges first emerged decades prior to the passage of the ACA. The concept was simple, that is, improve one’s position by using economies of scale and the enhanced negotiating power of a large group. If relatively small businesses came together, they could enhance their offerings, better negotiate terms for their beneficiaries, and reduce costs through pooling. The ACA sought to expand on this fundamental concept of insurance by granting greater access to this type of pooled resource. If a person or family lacked coverage, they could go to what was expected to be a vibrant exchange market and purchase the plan best suited to their needs. These insurance plans would have to conform to certain minimum Obamacare requirements. The ACA intended to use state-based exchanges rather than a single national exchange or public option. For those states that opted not to establish healthcare exchanges, the federal government filled the void by managing the exchanges in those states. Patients with a household income between 133% and 400% of the poverty line received subsidies to cover part of the premium when they bought coverage on one of the exchanges. The Obamacare Health Insurance Exchange Marketplace opened on October 1 2013. The exchanges constituted online markets for purchasing health insurance. The hope was that Americans would use their state’s ‘Affordable’ insurance exchange (marketplace) to obtain coverage from competing private healthcare providers.17 Shoppers (sic) were encouraged to use an online price calculator to see if they qualified for cost-assistance subsidies as well as Medicaid and CHIP. They could see side-by-side comparisons of qualified health plans, with the goal of helping them to find the best coverage circumstance. At that time, the administration estimated that there would be up to 29 million people enrolled in the exchanges by 2019. This projection proved wildly optimistic. Early on, as the marketplaces became active, other issues were raised. These included: the high price of plans for healthy young adults; employers opting out of providing health insurance for part-time workers; and narrow networks for beneficiaries. There is limited data in the peer-reviewed literature specific to NI specialists and the exchange marketplace. It is likely that elective cerebrovascular cases are impacted by narrow networks in general. What is less clear is how narrow networks might impact the most rapidly growing area in neuroIntervention: treatment of Emergent Large Vessel Occlusion (ELVO).38 With presentations beginning in late 2014 and papers published in early 2015, mechanical thrombectomy for stroke became the standard of care39 and this has led to a dramatic expansion in the number of cases performed.40–43 While substantial conversations have taken place on the type of center EMS should bring patients for evaluation and treatment, there has been seemingly less conversation on the impact of insurance markets.44 Further study will need to be performed in order to determine the role, if any, insurance coverage plays in directing ELVO patients. National health expenditures (NHEs) have grown, reaching $3.3 trillion in 2016. NHEs constitute a 17.9% share of the gross domestic product. Medicare spending also reached a historic $672.1 billion comprising 20.36% of total NHEs. Medicaid spending grew almost as high as Medicare to $565.5 billion in 2016, a 17.1% share of total NHE.45 Without question, recent growth in Medicaid and resultant costs are in large part due to the ACA. Congress passed the ACA along strict party lines in 2010. Republicans made the legislation and its imperfections part of a clarion call against the Obama administration. Indeed, ‘repeal and replace’, which at times seemed very unrealistic, likely helped drive an expansion of the Grand Old Party (GOP) in statehouses across the country and both houses of Congress in the years since 2010. With the election of Donald J. Trump to the highest office in the land and Republican control of both houses of Congress, Republicans had a unique opportunity to put in place their promise of repeal and replace. At first, contemplating the position of Democrats in red States, there was discussion about the possibility of some level of bipartisan support for making meaningful changes to the ACA. However, a variety of factors relating to the Trump administration’s first term and polarized congressional politics on both sides of the aisle soon signaled that ‘repeal and replace’ would be a strictly partisan affair. On May 4 2017, after substantial work and legislative maneuvering, the House of Representatives passed the American Healthcare Act by 217 votes to 213, aiming to repeal those portions of the ACA within the scope of the federal budget (via the budget reconciliation process), and thus gut the ACA. The bill was sent to the Senate for deliberation.49 The Senate opted to create its own bill and created a 13-person working group. Despite close calls, the Senate was never able to pass any legislation rejecting the ACA. Ultimately, in the summer of 2017, Congress opted to move on from outright efforts to repeal and replace. When one considers the circumstances outlined above, it is not surprising that the cost of insuring people through exchanges has increased dramatically since the inception of the ACA. For most exchange beneficiaries, this cost remains invisible because it is funded in large part by the US taxpayer. This explains how the market can sustain up to triple digit rate increases in various locales. The premium tax credit in the ACA de facto limits how much money many individuals or families spend because the benefit covers escalating costs. For those who are not benefiting from this subsidy (ie, enrollees with income over 400% of the federal poverty line), the costs can be prohibitive. In these groups, enrollment is diminishing. There is virtually no chance under current legislation that the legislative goal of reaching 29 million covered lives by 2019 will be achieved. Indeed, there were 5 00 000 fewer customers enrolled in 2017 plans compared with 2016. 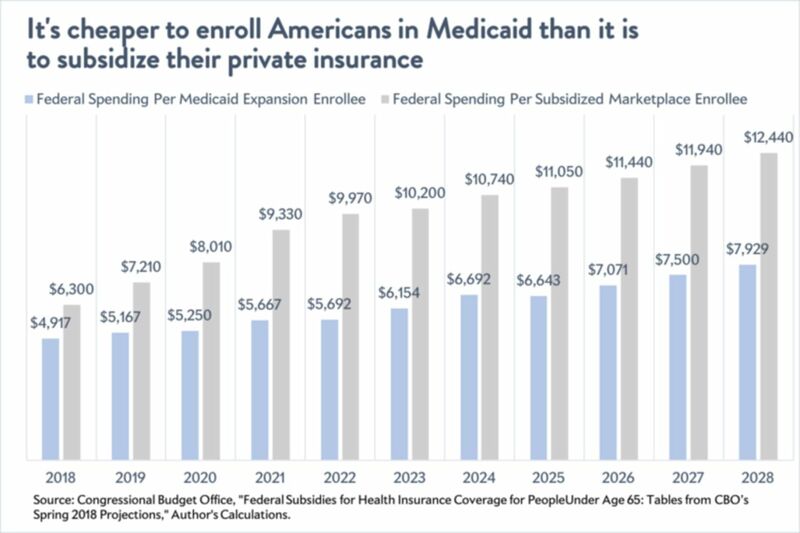 Per the CBO, this marketplace now costs much more on average per enrollee than people or families covered by Medicaid or Medicaid expansion.60 The Congressional Budget Office’s latest projections demonstrate that the federal government is paying out an average of $6300 annually for every subsidized enrollee in marketplace exchanges for fiscal year 2018. It estimates that number will rise to nearly $12 500 in 2028 (figure 1). In contrast, Medicaid spends $4230 per non-disabled adult, set to inflate at 5.2% annually to just over $7000 per person in 2028.61 62This trend is expected to further exacerbate with policy shifts designed to undermine the viability of the exchanges. Comparison of cost to the federal government of Medicaid vs. marketplace exchanges62Reprinted with permission of Jordan Weissman at Slate.com. The ACA was passed along strict party lines and has lived a highly political life from the time it was introduced. Since its passage, Republicans have used its provisions to mobilize their base. This has been a successful tactic for putting more Republican legislators into power. Over the years, there were numerous votes in Congress to repeal the ACA and detailed plans were put forward for what might come next. These plans had a unique safety valve, that is, the Obama administration would be unlikely to sign onto a law that repealed its signature legislation. The situation changed dramatically when in January of 2017, the Republicans found themselves in control of both houses of Congress as well as the Executive Branch. Aligning candidate Trump’s healthcare delivery proposals with Republican orthodoxy was challenging. The Republican-led Congress sought to address this multi-year ambition of repealing and replacing the ACA. The AHCA and Better Care Reconciliation Act of 2017 (BCRA) were largely constructed using traditional Republican elements in addressing repeal and replace.49 ,63 The BCRA or its analogs such as the Obamacare Repeal Reconciliation Act or the Healthcare Freedom Act could not muster the votes necessary to pass the Senate to reach a conference committee. Given the rules of reconciliation and other political realities, legislative efforts at repeal and replace receded into the background. In the wake of the failure to achieve ‘repeal and replace’ the Trump administration and Congress have made additional changes, which have further destabilized the ACA. These maneuvers have had dramatic implications regarding shifting perspectives on who is to blame for the challenges of the ACA. 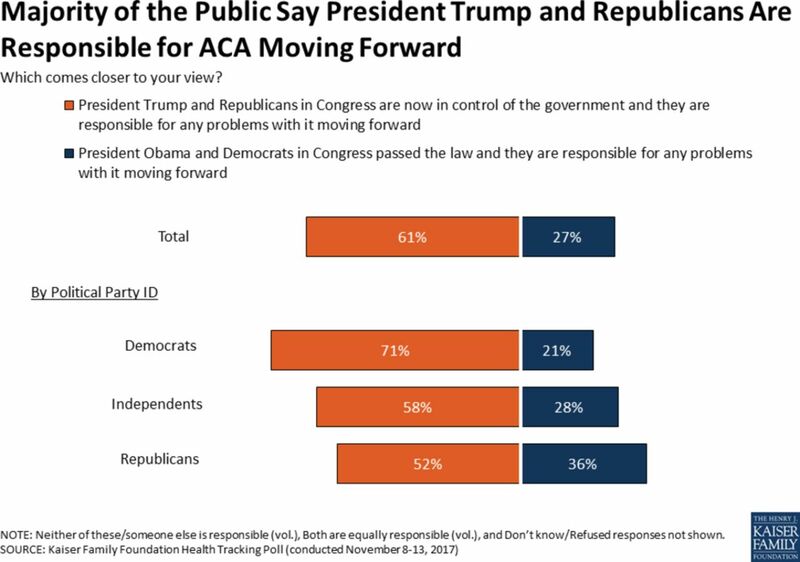 A telling Kaiser Family Foundation Poll suggests that Americans now largely consider President Trump and the Republicans to be responsible for the ACA moving forward63 (figure 2). The dynamic has thus dramatically shifted in that healthcare delivery, a topic that had galvanized the Republican base for years, now has the potential to negatively impact November elections for the GOP. American attitudes for which President and party are responsible for problems associated with the ACA63 Reprinted with permission from the Kaiser Family Foundation. Political pundits lost credibility in the 2016 presidential election. Comments about expected political outcomes should therefore be taken with a healthy dose of skepticism. Famed pollster Nate Silver of FiveThirtyEight predicts a three in four chance of Democrats taking control of the House of Representatives64 65 The Cook Political Report would suggest that Republican control of the Senate is more likely to remain intact after November.66The outcome of this election cycle could have major implications on the course forward for the ACA particularly as a predictor of 2020. Should the Republicans keep both legislative houses and in particular if they increase their slim majority in the Senate they might consider a further effort at repeal and replace.67 Should the Democrats take control of the House, it is difficult to imagine movement forward on healthcare delivery policies that would be agreeable to both parties unless the market continues to destabilize and threatens collapse. In 2020 and beyond, should Democrats return to the White House with some level of control of the federal legislatures, they will be confronted with significant decisions that could prove challenging at that time. While scholars might disagree with the inherent versus the policy-based instability of the ACA marketplace, we believe the current healthcare exchange marketplace to be unsustainable in the long term without additional health transformation efforts. Subsidized beneficiaries are unreasonably expensive for the US taxpayer and unsubsidized participants are confronted with unacceptably high out-of-pocket costs.68 Emboldened by the largely Republican debate regarding repeal and replace, the Democratic base is in many cases openly calling for an end to Obamacare and replacement with options such as single payer, Medicare Extra, Medicare for all, and other government-directed programs. These options are all forms of healthcare delivery that would likely have been unthinkable for a major political party to champion just a few years ago.69 The implications for the Democratic party supporting a shift to ‘single payer’ in a system currently dominated by employer-based insurance is unclear. The ACA has been a galvanizing element in US political debate since its passage in 2010. In the current political climate, achieving bipartisan support for healthcare legislation seems an unlikely goal. Republicans rode a wave of resentment regarding the ACA and its party line passage into large-scale political victories from 2010 through, and including, the November 2016 elections. Elements of the ACA have become ingrained (eg, insuring patients with pre-existing conditions) and it is unlikely efforts at repeal and replace would ever remove all elements of this landmark legislation. One of many provisions within the legislation, the healthcare exchange marketplace, is charting an unsustainable path requiring large taxpayer subsidies without which coverage would be unaffordable for many potential participants. This minority segment of the beneficiary market has, and likely will continue, to result in a greater level of angst than its relatively small numbers might have suggested it would. Solutions vary widely between the two political parties, but it would seem clear that we as healthcare providers must anticipate significant changes in the ever-present goal of providing health coverage for all Americans. Patient Protection and Affordable Care Act. Public Law No: 111-148: H.R. 3590, 2010.
. Obama health care for all Americans: practical implications. Pain Physician 2009 12:289–304. https://www.census.gov/prod/2011pubs/p60-239.pdf Accessed 5 Sept 2018. Congressional Budget Office , 2016. Federal subsidies for health insurance coverage for people under age 65: 2016 to 2026 https://www.cbo.gov/publication/51385 (accessed 10 Aug 2016). The Medicare Access and Chip Reauthorization Act of 2015. http://www.congress.gov/bill/114th-congress/house-bill/2. Nicola GN , et al. Department of Health and Human Services, Centers for Medicare & Medicaid Services. Medicare Program; Revisions to Payment Policies Under the Physician Fee Schedule and Other Revisions to Part B for CY 2019; Medicare Shared Savings Program Requirements; Quality Payment Program; and Medicaid Promoting Interoperability Program. Proposed rule 2018. The New York Times. House clears path for repeal of health law;2017 https://www.nytimes.com/2017/01/13/us/politics/affordable-care-act-congress-budget.html?_r=0. The White House. Executive order minimizing the economic burden of the Patient Protection and Affordable Care Act pending repeal. https://www.whitehouse.gov/the-press-office/2017/01/2/executive-order-minimizing-economic-burden-patient-protection-and (accessed 2 Apr 2017).
. Evolution of US health care reform. Pain Physician 2017;20:107–10.
. A critical analysis of Obamacare: affordable care or Insurance for many and coverage for few? Pain Physician 2017;20:111–38. https://www.alexander.senate.gov/public/index.cfm/pressreleases?ID=8924A7D6-786A-47C6-8C7F-D97C7E3FC8FA (accessed 21 Aug 2017). Contributors JAH wrote the initial draft. All authors were given the opportunity to review and provide editorial suggestions. All authors approved the final draft. Competing interests Competing Interests: JAH reports a grant from the Neiman Health Policy Institute as the only relevant disclosure. CK is a consultant for Primal Pictures. CG is on the Medical Advisory Board of Axial Healthcare. TL-M, GNN, JM, DAR, and DRM report no relevant disclosures.